Sorry this took a while! I've been watching The Time I Loved You instead >< I did a short review but I'll only post it after I finish the recaps for this! We start off with Jiwon in the recording studio to record her song about Zoe the donkey. She says she wrote some of the lyrics in Grasse and finished them on the day after they returned to Korea. But she's very worried about recording. "Can I disappear for awhile?" Music producer: There is more emotions than normal singers. And he says it's easy to follow and a good song for her portfolio. He's basically trying to assure her and tell her to relax. But when she goes in to record, she's still worried haha. "How will people accept this??" Still, she seems pretty satisfied with the song. "It has a feel of a pretty indie band song. I really like indie bands." The music producer keeps praising her and saying she's doing well. They want to end the recording but Jiwon says "Let me do it one more time!" Hahahaha. But they let her record one more time anyway. The PD asks how her unnie is doing. Jiwon: Unnie is always beside me....it's really nice. 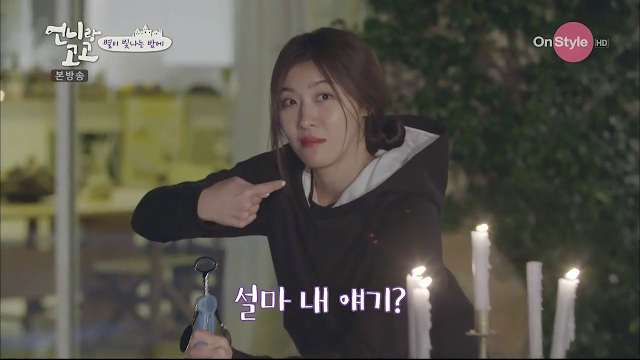 Then she complains a bit about her unnie finding her all the time haha, but promptly apologises to her unnie. Now moving back 1 month to their time in Grasse. The first thing she does when she wakes up is to play music - Cherry Blossom Ending by Busker Busker. Then she walks to the kitchen area and picks up something to smell. It turns out to be her J.One Garden perfume which she made earlier. There's a montage of her constantly smelling it, and making her unnie smell it. In the interview, Jiwon: "I'm very sensitive to scents and like them a lot. What I like more about where we are living now in Grasse is that wherever we go, the smell is very fresh. It makes me want to make another perfume, learn more about it." So half of today's episode is about them learning more about perfumes. First up is the Grasse Institute of Perfumery, a perfume school. Their teacher is Professor Latty, and teaches them about the theory of perfume. The 2 of them keep nodding but I keep wondering whether they really understand what he's saying? (Also, the dubbing of the professor in korean is really strange.) Anyway, he lets them try the scents. When Jiwon smelled the tuberose scent, she said that it's really similar to the scent she likes. Yookyung think it's rose but it isn't! Hehe her reaction when she heard that to make 1kg of perfume, 3300kg of roses are needed. After the theory lesson, they move on to making the perfume. While Prof Latty is adding the scents, he lets them smell the droppers. Lol Jiwon thinks musk smells like their mum. "Omma! Hello." Then Yookyung stuffs the dropper into her pocket. Jiwon also pockets a few droppers haha. They then get the chance to try adding the scents. Yookyung successfully adds 1g of the thing. Jiwon needs to add 0.5g of it. She says this is more nerve-inducing than acting. And then she ends up with 0.51g HAHAHA. 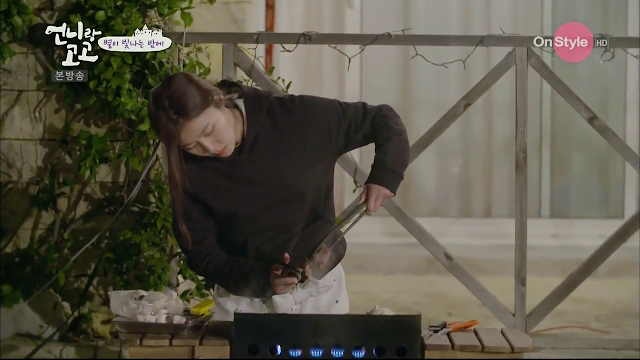 They try the finished product and Jiwon thinks it smells like nobility. And because it's a waste to just throw away the strip after smelling it, she puts it on her wrist. While driving to their next destination, Jiwon in a slightly hesitant voice: "We only have a really tiny bit of that scent. Can unnie make this for me? Since unnie is a scent designer...."
Yookyung: Okay, I'll make it for you. Jiwon: This perfume is called ah bon. They arrive at a perfume museum. Yookyung: I really wanted to come here with you at least once. Awww. The editing splits the places they go into 5 keywords. 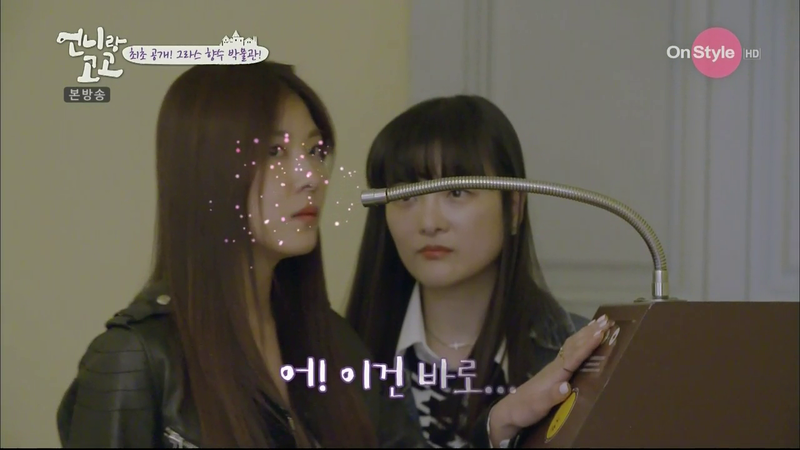 While looking at the exhibits, Jiwon suddenly spies a cool looking machine. You press it and a scent comes out from the nozzle. Jiwon think it's similar to the scent they just made. Keyword 2: Personal perfume case. Jiwon just keeps gasping at all of them and says she wants them all. Jiwon: I'm in shock right now. Like I found a world I didn't know about? Jiwon is very fascinated by it and wants one too haha. Yookyung: No no no, the person beside you will be very tired. Jiwon: I'm going to make one in Seoul. Oh but I can make one here too. The garden has a lot of orange trees for their scent. Jiwon: I really want to eat them!! Jiwon: Everyone!! This is my house. 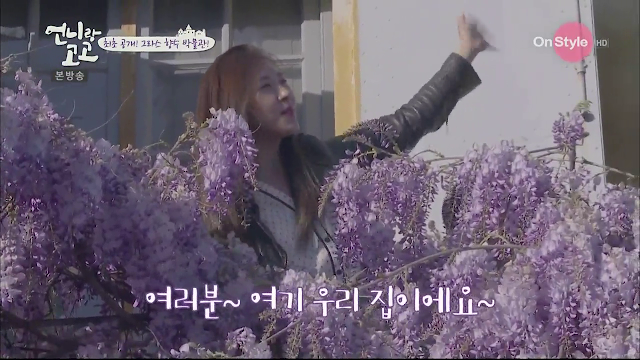 Yookyung: There are a lot of flies. Now we're back in the house and they're having a barbecue for dinner. Omg she tries a bite of the meat and it's so hot but she's holding stuff in both hands so she can't take it out. Hahaha I feel so bad for laughing cos she must have been in pain but LOL!!! Suddenly, Jiwon gasps and starts charging into the house. Yookyung: I think I know why she's like that. It seems like she's going to find music. While Jiwon is gone, the crew interview Yookyung on what kind of dongsaeng Jiwon is. Yookyung talks about the large age gap between them, and says Jiwon is more mature and brave than her. She's asked what she would change about Jiwon. While Yookyung is talking, Jiwon suddenly goes "Unnie, you haven't seen my phone right?" and Yookyung is like ...mm. Haha she's feeling awkward since she was just talking about Jiwon. Jiwon starts eating so Yookyung doesn't continue her answer but the crew is like let's continue the interview. So Yookyung starts talking and Jiwon is like is she talking about me? Yookyung says something about Jiwon trying very hard to live a disciplined and morally upright life and she hopes Jiwon can let go and relax more. Jiwon: Some people must go to the club to have fun but I unwind best by drinking wine with people I like. I don't know what I should do to relax more. Jiwon: I relaxed a lot here. It's the side which I only show to people to I'm really close with. DJ Jiwon makes an appearance! The first line of the song goes "Where shall we go tomorrow?" 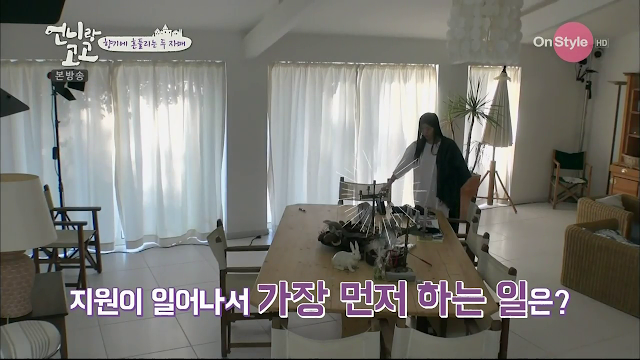 then Jiwon turns around and asks her sister: "So where shall we go tomorrow?" LOL. Jiwon: There's something different between unnie and me. Basically, Jiwon likes to stop and admire the stars even while cooking while Yookyung only concentrates on cooking hehe. She tries to play the next song (Cherry Blossom Ending again) but the connection keeps getting cut off so she gives up. The crew asks if they can request songs and Jiwon is like yup. Then they request her song hahaha. Then her phone battery dies so they use Yookyung's phone. Jiwon asks her unnie to sing. Aww her unnie knows all the lyrics! Jiwon: Oh unnie you know the lyrics better than me! In the interview, Jiwon says it's the first time they've sung together and she really liked it. There's a montage of their time in Grasse so far and Now In This Place is playing in the background, and this song just makes everything SO SAD. 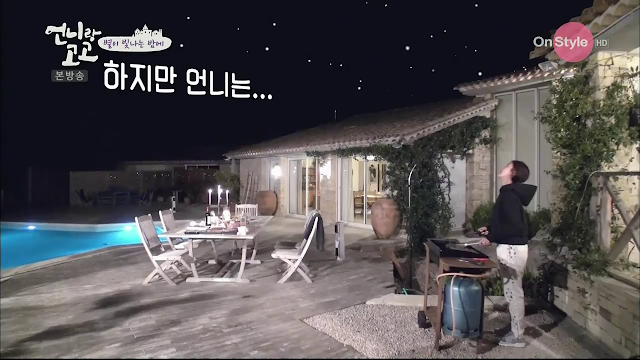 We go back to them singing in the yard and Jiwon is singing really loudly now hehe. 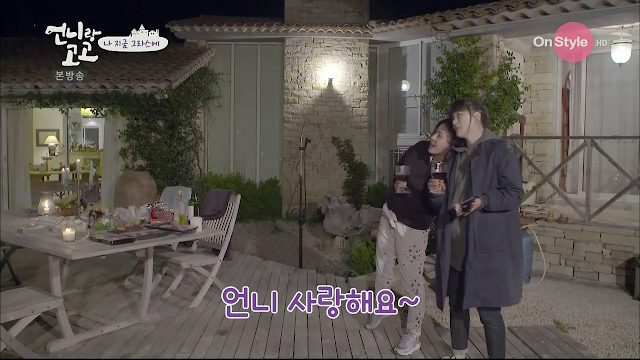 And they finish singing the rest of the song, with Jiwon yelling "Unnie I love you!!" during the saranghaeyo part.